Research background: Because the active labour market policy requires high resources, it is important to analyse the effectiveness of its instruments. For the unemployment, it is essential to identify the groups of persons threatened by the long-term unemployment, to assess the impact of programmes on exit from unemployment and monitoring the disbursement of funds. 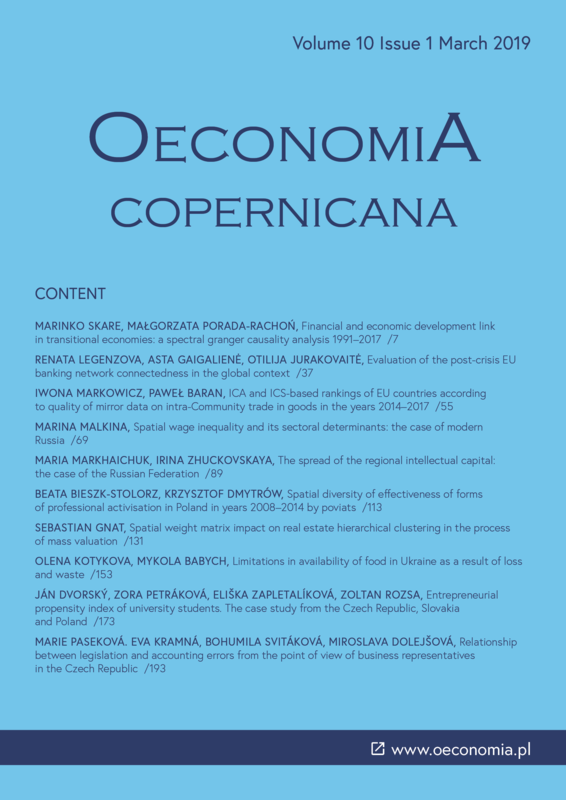 Purpose of the article: The goal of the article was identification of clusters of poviats in Poland with respect to cost and employment effectiveness of basic forms of professional activisation in the years 2008–2014. Methods: The poviats were clustered by means of the k-means method. Variables were standardised and the number of clusters was determined by means of the v-fold cross-validation. Findings & Value added: The analysis did not allow to unambiguously specify areas in Poland with better use of funds allocated in the activisation programmes. The poviats in the middle-east Poland were generally characterized by worse values of effectiveness. However, the unemployment rate in these areas was relatively small. On the contrary, the poviats in the north-east Poland had high unemployment rate and the funds were used effectively. Assessment of effectiveness of forms of professional activisation is very important because the activities of poviat labour offices influence the counteraction to unemployment. Adil, I. H., & Irshad, A. R. (2015). A modified approach for detection of outliers. Pakistan Journal of Statistics and Operation Research, XI(1). doi: 10.18187/pjsor.v11i1.500. Bieszk-Stolorz, B. (2017). Cumulative incidence function in studies on the duration of the unemployment exit process. Folia Oeconomica Stetinensia, 1. doi:10.1515/foli-2017-0011. Bieszk-Stolorz, B., & Markowicz I. (2015). Application of survival analysis in efficiency evaluation of professional effectiveness enhancement programme. Acta Universitatis Lodziensis. Folia Oeconomica, 1(311). doi: 10.18778/0208‐6018.311.09. Calmfors, L., Forslund, A., & Hemstrom, M. (2002). Does active labour market policy work? Lessons from the Swedish experiences. CESifo Working Paper Series, 675. Card, D. E., & Levine, P. B. (2000). Extended benefits and the duration of UI spells: evidence from the New Jersey extended benefit program. Journal of Public Economics, 78(1). doi: 10.1016/S0047-2727(99)00113-9. Charrad, M., Ghazzali, N., Boiteau, V., & Niknafs, A. (2014). NbClust package for determining the number of clusters in a dataset. In Conference paper: 5th meeting on statistics and data mining at: Djerba. Tunisia. European Commission (2013). Design and commissioning of counterfactual impact evaluations, Luxembourg: Publications Office of the European Union. Retrieved from: https://taipi.eu/object/document/20/attach/KE-30-13-216-ENN.pdf (23.10.2018). Gerfin, M., & Lechner, M. (2002). A microeconometric evaluation of the active labour market policy in Switzerland. Economic Journal, 112(482). doi: 10.1111/1468-0297.00072. Hadas-Dyduch, M., Pietrzak, M. B., & Balcerzak A. P. (2016). Wavelet analysis of unemployment rate in Visegrad countries. In T. Kliestik (Ed.). 16th international scientific conference globalization and its socio-economic consequences. University of Zilina, The Faculty of Operation and Economics of Transport and Communication, Department of Economics, 5th – 6th October 2016. (Part II.). Zilina: University of Zilina. Hahn, J., Todd, P., & Van der Klaauw W. (2001). Identification and estimation of treatment effects with a regression-discontinuity design. Econometrica, 69(1). doi: 10.1111/1468-0262.00183. Heckman, J. J., Lalonde, R. J., & Smith, J. A. (1999). The economics and econometrics of active labor market programs. In Handbook of labor economics, 3 PART(1). doi: 10.1016/S1573-4463(99)03012-6. Hunt, J. (1995). The effect of unemployment compensation on unemployment duration in Germany. Journal of Labor Economics, 13(1). doi: 10.1086/298369. Jacobi, L., & Kluve, J. (2006). Before and after the Hartz reforms: the performance of active labour market policy in Germany. IZA Discussion Paper, 2100. Katz, L., & Meyer, B. (1990). The impact of the potential duration of unemployment benefits on the duration of unemployment. Journal of Public Economics, 41(1). doi: 10.1016/0047-2727(92)90056-L.
Knapińska, M., & Małecka-Ziembińska, E. (2016). Productivity and labor costs in the OECD countries – elements of comparing analysis. Business and Management Review, 7(3). Lalive, R. (2007). Unemployment benefits, unemployment duration, and post-unemployment jobs: a regression discontinuity approach. American Economic Review, 97(2). doi: 10.1257/aer.97.2.108. Local Data Bank. Retrieved from: https://bdl.stat.gov.pl/BDL/start (25.10.2018). Moffitt, R. A. (1985). Unemployment insurance and distribution of unemployment spells. Journal of Econometrics, 28(1). doi: 10.1016/0304-4076(85)90068-5. MRPiPS, Retrieved from: https://archiwum.mpips.gov.pl/praca/fundusz-pracy/efektywnosc-form-promocji-zatrudnienia-i-aktywizacji-zawodowej/ (15.09.2018). Murawska, A. (2016). Differences in unemployment among persons in a special situation on the labour market on the example of Polish provinces. Oeconomia Copernicana, 7(3). doi: 10.12775/OeC.2016.022. Reddy, D., & Jana, P. K. (2012). Initialization for K-means clustering using Voronoi diagram. Procedia Technology, 4. doi: 10.1016/j.protcy.2012.05.061. Tatarczak, A., & Boichuk, O. (2018). The multivariate techniques in evaluation of unemployment analysis of Polish regions. Oeconomia Copernicana, 9(3). doi: 10.24136/oc.2018.018. Wiśniewski, Z., & Maksim, M. (2013). Active labour market policies in Poland. CESifo Forum, 14(1). Woźniak-Jęchorek, B. (2015). Institutional determinants of regional diversity of labor market in Poland. Equilibrium. Quarterly Journal of Economics and Economic Policy, 10(1). doi: 10.1 2775/EQUIL.2015.007.